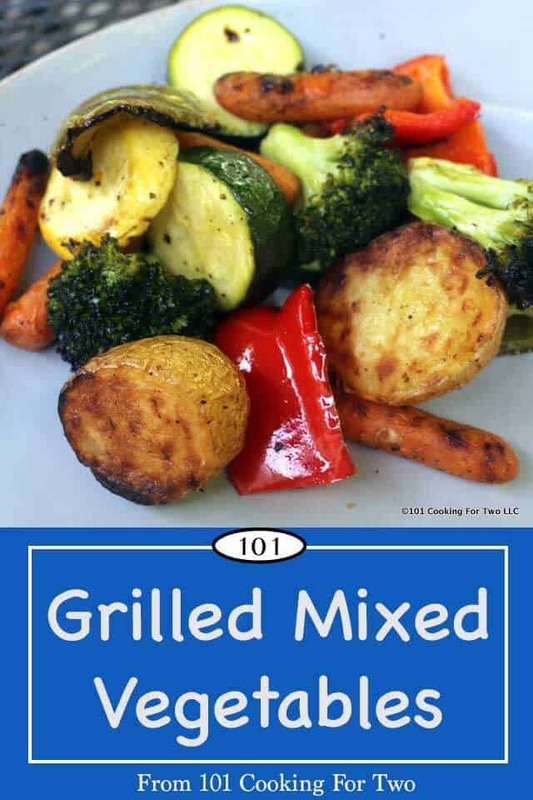 I have been doing this repeatedly this spring and thought it was time to let all of you enjoy this great way to grill veggies with all those grill meals this summer. The idea is simple. Treat the grill as an oven… kind of at least. Most of my grilling is done in the 450-500 range, and I have a large grill surface. So somewhat like an oven but there is that direct heat thing going on so give all the veggies a nice coat of olive oil and season to taste. 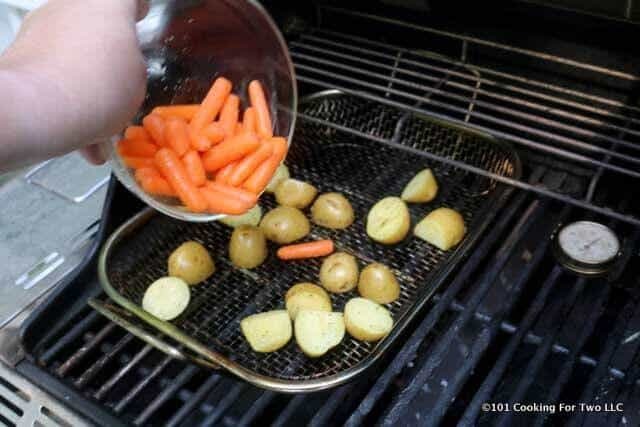 Make sure to give it a good stir every 5 minutes, and you can grill most any veggie in a grill basket. Please note… NO ALUMINUM FOIL. 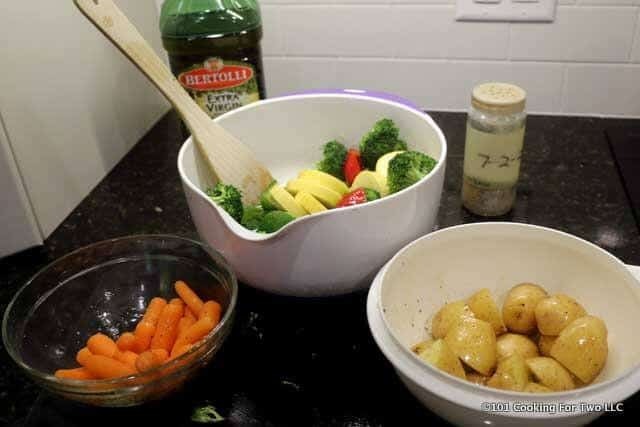 Now veggies cook at different rates so decide what you want in your veggies and add them at the correct time. I love potatoes. They take 30 minutes. Add some baby carrots at the first 5-minute stir… they take 25 minutes. Zucchini, yellow squash, bell peppers, and broccoli take 15 minutes. But what if you want different veggies. Here is a general guide from VegKitchen that should help. Or as always, Google is your friend. An easy 5, great taste, will be done over and over. Notes: be sure the veggies have a coat of oil. Plus a little salt and pepper. I used my 7:2:2 Seasoning. Preheat the grill to 450-500 range surface temperature. That is medium on my super-duper grill but medium high on lesser grills. Prep the veggies you want. I’m doing small potatoes cut into about 1 inch pieces (30 minutes). Baby carrots (25 minutes). Broccoli, peppers, zucchini and yellow squash all at 15 minutes. 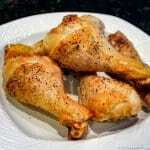 Give them all a nice coat of oil and season with some salt and pepper to taste. I used my 7:2:2 seasoning. Start grilling and stir every 5 minutes. Potatoes first then at the first stir add the carrots. At 15 minutes add the other veggies. 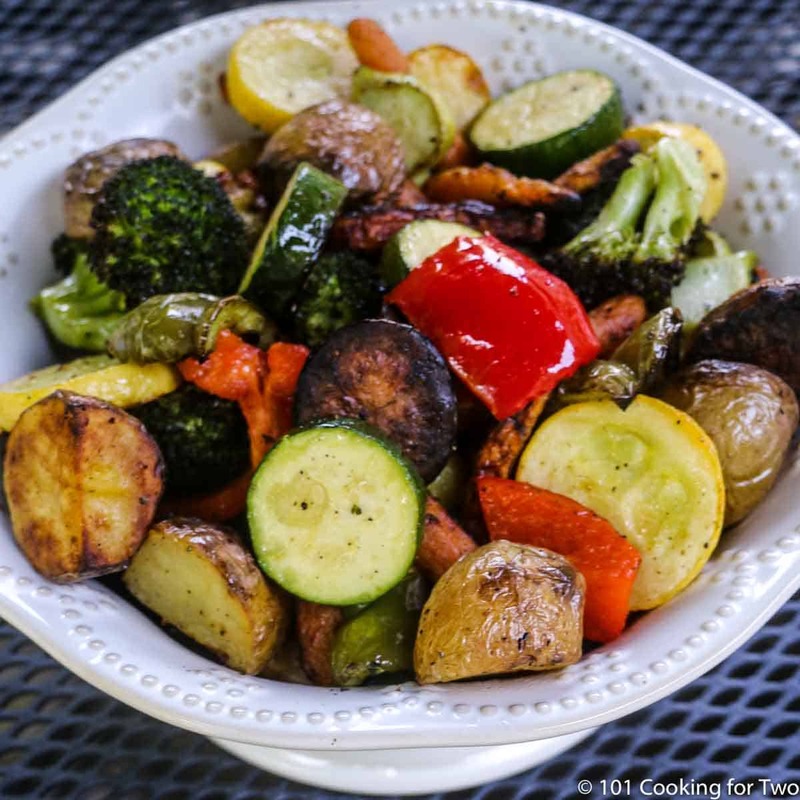 Nothing's better than roasted veggies unless they are grilled. Now you can do them on your grill while you cook your dinner. 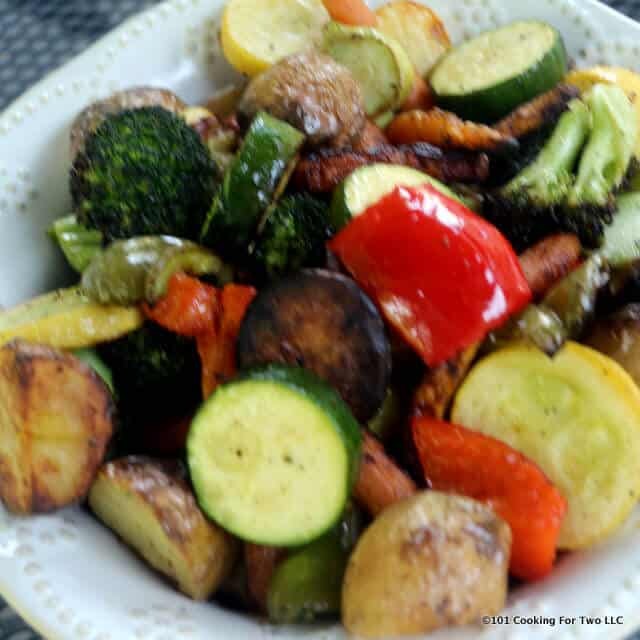 A delicious blend of mixed vegetables cooked on the grill! Prep the veggies you want. I'm doing small potatoes cut into about 1 inch pieces (30 minutes). Baby carrots (25 minutes). Broccoli, peppers, zucchini and yellow squash all at 15 minutes. 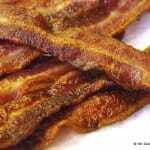 Give them all a nice coat of oil and season with some salt and pepper to taste. I used my 7:2:2 seasoning. 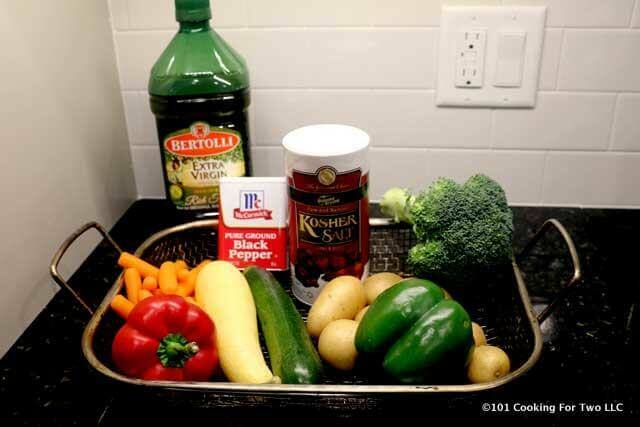 Be sure the veggies have a coat of oil. Plus a little salt and pepper. I used my 7:2:2 Seasoning. Other veggies can be used. See link in post. 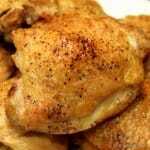 I would love to have a good grill pan for this – do you recall what brand you have or source? 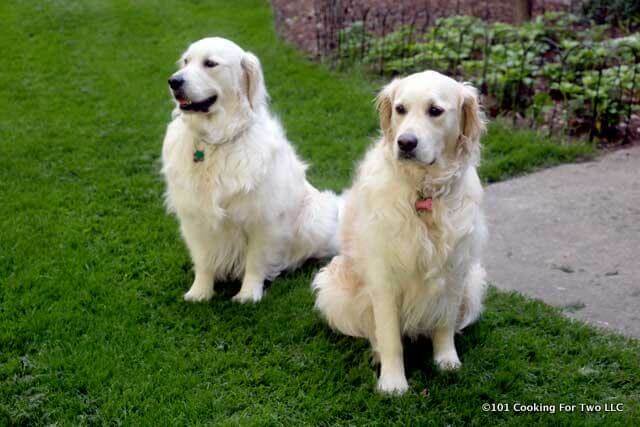 Many years ago from William Sonoma. It never dies but is discolored and needs to be soaked to clean. I have had others but keep going back to this one. Pamper Chef has something similar.